The Lego Company really did explode upwards in the 1970s, as technology allowed them to make better shapes, add motorised units, and it went from the little building blocks we put in our mouths a babies to something much more important, and much more exciting. This Denmark company knew that had a great product for kids imaginations, but they needed to keep the kids interested. So they actually developed specific sets to buy that made something in particular. Do you remember the Vintage cars that they bought out in 1971, which allowed you to make a great looking set of cars, they also produced small electrical building sets that really had the boys wanting to get hold of Lego. But one of the most important things Lego could do, was to let you believe you could build anything with their sets, and thus the living room floor would be full of Lego bases, and thousands of coloured bricks that would build airports, hotels, spaceships and with all the other extras they provided you could put cranes in, or little characters and batteries to light up some areas. One of the greatest TV commercials for Lego was a sound a- like Tommy Cooper ( No it really was not the real one(, who would narrate a quick story, and as he did so the stop action filming would build it using everything available from Lego. Of course the commercials did it in a few seconds, but wow it was a fantastic inspiration to kids of all ages. Just ask my dad. 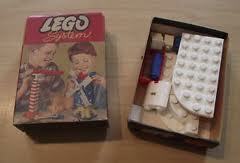 The Lego toys really relate back as far as the 1940s, and Lego in Danish means “play well” and were originally called Automatic Binding Bricks. Lego have produced about 400 million Lego bricks for sale all around the globe, and still has many factories outside Denmark. If you were one of the people that missed the Lego fun and all you see is different sized interlocking coloured bricks, and brown base plates and red roof type plates, then you missed out on…..well that’s a good point. Was it really as great as we remember, after all my sister would still eat her Lego bricks from the great space station I had made in my room.